Wine, cheese, frogs legs, snails and the Eiffel Tower. With Iconic landscapes, romantic views and Europe’s highest mountain ranges. In France you are treated to a blend of man-made and natural beauty like nowhere else in Europe. You’ll also discover a dizzying array of artistic and architectural wonders – soaring cathedrals, chandeliered châteaux, and museums filled with cultural icons. To experience everything France has to offer. Make sure you go to France with a few extra Euros in your pocket, so you can soak in all the food, wine, and beauty. Hopefully this will help you. The French government rates hotels on a one- to four-star system. One-star hotels are budget accommodations, two-star lodgings are quality tourist hotels, three stars go to first-class hotels and four stars are reserved for deluxe. Hostels will range from €20-40 a night, depending on where you’re staying, Paris will be on the higher end. Look into renting a room or apartment through Airbnb. In an expensive city like Paris, this will be your cheapest option. Prices start from €15 for a shared room and €45 for an entire apartment. A fresh baguette, croissant is possibly the most iconic French food you can buy. The bread is just as delicious by itself as it is with a traditional French cheese such as gruyère or brie. Escargot (snails) may seem like a strange dish, but in France they’re a delicacy, served hot in their shells with heaps of garlic and butter and something I had on my bucket list along with frogs legs (Which are harder to find). Buying your own food from the many markets in France can be very cheap and the best way to experience the country’s cuisine. Tip: Before dinner, pernod, kir, champagne, vermouth may be offered. Wine is always served with meals. After dinner, liqueurs are served. Tip: Leaving food on your plate is impolite. Tip: Don’t Put Your Hands on Your Lap, the polite way to sit is with both hands visible on the table. Keep ’em where they can see ’em, or they might wonder what you’re doing down there. Tip: Don’t Eat the Salad Before Your Main Meal a salad is considered a palate cleanser and digestion aide after the main course has been consumed and before the cheese or dessert has arrived. Tip: Don’t Expect the Waiter to Bring You the Bill The French are very laissez fair about hanging out in cafes, bistros or restaurants as long as you’d like. To them, handing out the check is akin to rushing you out the door. They’re not necessarily ignoring you, neglecting you or providing poor service. They’re just happy to have you linger. Tip: Don’t Ask for a Doggie Bag, taking leftovers home is frowned upon in France. Portions aren’t overly gargantuan here like they are in some other countries (ahem, America) anyway. Within most major cities public transportation is efficient and cheap. In smaller towns, such as Rouen, St-Malo and Honfleur it’s easy to navigate on foot. Driving, is a good way to travel around the French countryside, If you need to hire a car try Rhinocarhire.com. Remember to keep right (overtake on the left), speed limits are in kilometers per hour and if it’s raining speed limits drop 10 km/h. Trains are known for there on-time performance and are comfy, you can travel in first or second class by day and couchette by night. Most trains have light dining facilities. ANY encounter or transaction begins with “bonjour“. At least learn some of the basics, the French like it if you try. Tip: Address people as Monsieur, Madame or Mademoiselle without adding the surname. Tip: Do not slap your open palm over a closed fist (this is considered a vulgar gesture). Tip: The French do not tell or like to hear jokes. They prefer intelligent and satirical wit. Funny stories of real life situations are appreciated. 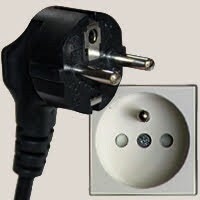 Type E: This socket will also work with plug type C. Plug F will work if it has an additional pinhole. Your need for a power plug adapter depends on the power plugs used in your own country. The Mu Worldwide Traveller Duo is a superb addition for those who travel light and it stays in my travel bag all the time. It doesn’t matter where you go in the world this has you covered and will keep you charged up and ready to go with US and Euro plug adaptors and two USB ports. ‘Free’ roaming in the EU has now started, failing that there’s another easy trick to get free roaming simply by swapping your Sim. You can buy a French SIM card from one of the three main French providers, BouyguesTélécom, Orange, or SFR. (You’ll need an unlock phone though) Otherwise, it may be best to stick to free Wi-Fi. Some ‘Free’ roaming does have it’s limits though, so you’ll want to check with your provider. Time France is on Central European Time, which is 1 hour ahead of Greenwich Mean Time. Smoking is banned in all public places in France, including cafes, restaurants, and nightclubs. It’s permitted on outdoor and semi-enclosed terraces. Drink wine In France, the wine is cheaper than water. Drinking Laws The legal drinking age is 18, but persons under that age can be served alcohol if accompanied by a parent or guardian. Skip the clubs Clubs in France are expensive and charge a ridiculous entrance fee. Tipping By law, all bills in cafes, bars, and restaurants say service compris, which means the service charge is included. However, it is customary to leave €1 or €2, depending on the quality of the service; in more upscale restaurants leave €5 to €10. When family and close friends greet one another, they often kiss both cheeks. Sadly being a tourist makes you a target, never leave valuables in plain sight. Don’t expect 24/7 shops. Many French shops close from 12:00 to 2:00 for a leisurely, civilized lunch lull and Lots of businesses take a few weeks off in July or August for their annual summer holiday. Most French take the month of August off for their summer holidays. It can be a nightmare time to travel the country as a foreigner as major tourist areas, especially the south of France and the coast, are rammed full. Don’t Put Your Hands on Your Lap, the polite way to sit is with both hands visible on the table. Keep ’em where they can see ’em, or they might wonder what you’re doing down there. Don’t Step in the Merde The French love their dogs, but don’t seem to have had the pick up after them memo. The sidewalks, parks and even some door stoops are literally littered with doggy doo-doo. Don’t Touch the produce at le Marché poking, prodding or picking up the goods is a big non-non. There’s an unspoken hands-off policy at a French marché. Let the vendor pick up the produce for you, and just point if you want to select a specific item. Don’t Eat the Salad Before Your Main Meal a salad is considered a palate cleanser and digestion aide after the main course has been consumed and before the cheese or dessert has arrived. Don’t Bring Wine to a Dinner Party To the French, this is a bit of an insult implying that they don’t know the proper wine to serve at their own party. Don’t Expect the Waiter to Bring You the Bill The French are very laissez fair about hanging out in cafes, bistros or restaurants as long as you’d like. To them, handing out the check is akin to rushing you out the door. They’re not necessarily ignoring you, neglecting you or providing poor service. They’re just happy to have you linger. Don’t Ask for a Doggie Bag Taking leftovers home is frowned upon in France. Portions aren’t overly gargantuan here like they are in some other countries (ahem, America) anyway. Don’t Forget to Greet the Shopkeeper you should always acknowledge the clerk with a crisp bonjour – better yet, bonjour Madame or Monsieur. Mercis are always appreciated as well. The French are the world leaders in fashion. Dress is conservative and understated. Casual attire is inappropriate in cities. Be clean and well-dressed at all times. The French do not tell or like to hear jokes. They prefer intelligent and satirical wit. Funny stories of real life situations are appreciated. Driving, is a good way to travel around the French countryside, remember to keep right (overtake on the left), speed limits are in kilometers per hour and if it’s raining speed limits drop 10 km/h. Have you been to France? What’s your favourite place and time of year to visit?